Plantar fasciitis is an inflammation and degenerative change of the plantar fascia, which is the deep tissue located on the plantar region of the foot. The plantar fascia itself is a thick, connective tissue aponeurosis that inserts at the tuberosity of the calcaneus and divides into five tiers, each traveling to a respective toe. Plantar fasciitis is a very common condition that impacts many different patients. Sources suggest a lifetime incidence of 10 to 15%. The condition is believed to be responsible for up to 1 million office visits per year. It does have a peak in the ages 40 to 60, and a higher prevalence is seen in dancers, runners, and athletes. (Williamson and Crowder, 2016). Risk factors for developing plantar fasciitis are many. People who stand for long periods of time, jumping sports, flat feet, and obese patients are all at risk. Patients with high arch are also at risk. Professions that stand for long periods of time such as factory workers or health care professionals do have a higher incidence. Plantar fasciitis is particularly common in runners. Running creates repetitive micro-trauma to the plantar fascia which can increase the incidence. Runners should avoid rapid increases in mileage and should be cautious about increasing their training regimens. Good, supportive shoes may help avoid the development of the disorder, and shoes should be replaced every 300 to 500 miles run. The history and physical related to plantar fasciitis is fairly straight forward. Patients will classically complain of intense pain with the first few steps out of bed in the morning. With more movement, pain usually improves but will worsen later in the day. Prolonged standing worsens pain, while rest improves. The pain may be described as sharp, dull, or aching. In runners, asking about a sudden increase in mileage or training is important. Profession, work schedule should be questioned. The physical exam should start with watching the patient walk into the room. Gait analysis may reveal imbalances in the calves or Achilles tendons which can translate more pressure to the feet. The classic area of pin-point tenderness is along the proximal insertion of the plantar fascia on the calcaneus. There may also be pain with foot dorsiflexion, which will stress the plantar fascia. Plantar fasciitis can be unilateral or bilateral. The presence of pes planus, pes cavus, or over-pronation of the foot should be documented. The entire foot, including the Achilles’ tendon, calves should be palpated for pain. Other differential diagnosis, including Achilles tendonitis, tarsal tunnel syndrome, neuropathic pain, stress fracture, and other forms of tendinitis should be ruled out. The diagnosis is almost exclusively clinical. Further testing and imaging is rarely needed, but may be warranted to rule out another diagnosis. In patients whom a stress fracture is a consideration, radiographs can help rule this out. Nerve studies can indicate entrapment of the nerve, as seen in tarsal tunnel syndrome. The treatment of plantar fasciitis is mostly conservative. Sometimes the solution may be as simple as counseling patients on appropriate footwear. Sandals and barefoot walking should be avoided. Patients who are active or stand for long periods of time should have supportive shoes. Runners should be counseled on proper shoe fitting, mileage maintenance, and training procedures. Initially, rest and stretching should be helpful. Patients should avoid prolonged periods of walking and standing. Strengthening of the calves and Achilles tendon can help take pressure off of the plantar fascia. Obese patients should be counseled to lose weight. Custom orthotics may be costly and have questionable benefit. The main concern is having a stable, supportive shoe. Exercises above should focus on toe curls, towel curls, and other stretches that help strengthen the foot. Numerous educational handouts for patients are available on the web. Massage with a frozen water bottle or golf ball helps with inflammation. Patients may also benefit from a short course of anti-inflammatory medication such as naproxen, ibuprofen, or meloxicam. Tylenol can be used for pain. Patients with intractable pain in the plantar fascia or who fail conservative therapy can be referred to podiatry or physical therapy for further management. Corticosteroid injections are an option, but may cause significant pain. There is a significant risk of actual rupture of the plantar fascia or calcaneal fat pad atrophy. Patients who do not respond to all of the above may be surgical candidates. An experienced surgeon may perform an open or endoscopic plantar fasciotomy. Surgery should be reserved as a last resort. Plantar fasciitis is a very common podiatric diagnosis that is easily manageable in primary care. Certain professions, as well as runners are at risk for development of plantar fasciitis. The classic presentation is significant pain that is worse with the first few steps of the morning, accompanied by point tenderness over the insertion of the plantar fascia on the calcaneus. The treatment is conservative, but those who do not respond to conservative therapy can be referred on for possible injection or operative management. Buchbinder, Rachelle (2018). 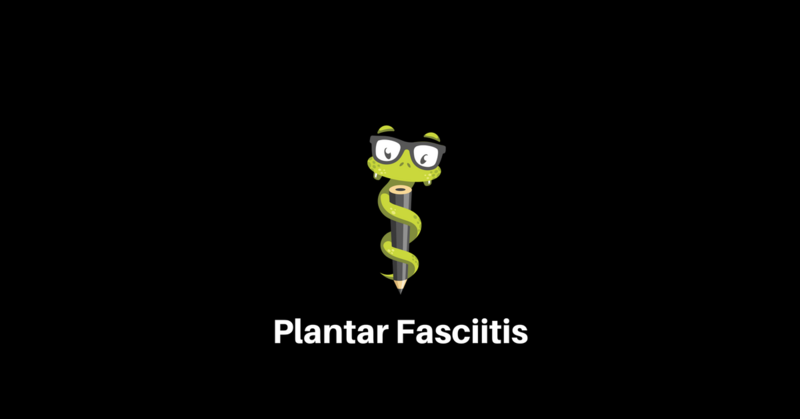 Plantar Fasciitis. UpToDate. Date of Access 28 March 2018. Williamson, A.J and Crowder, K.M. (2016). Plantar Fasciitis. The Five Minute Clinical Consult. Wolters Kluwer. This article should not be used in any legal capacity whatsoever, including but not limited to establishing standard of care in a legal sense or as a basis of expert witness testimony. No guarantee is given regarding the accuracy of any statements or opinions made on the podcast or blog.